Sounds silly, but it's been great so far. I am really learning a lot from it and how writing narrative fiction compares to and differs from writing screenplays. Ever since watching his show The Wire, I've wanted to read this one from David Simon, a former crime journalist from Baltimore. I've barely into it, but it is pretty good. Truthfully, it's kind of slow so far, and it's pretty much more of the same from the show. In fact, I think that this book might have inspired Simon's 2 television series. Nevertheless (! ), it's still really interesting. This book, from Shane Hipps, is really interesting. In fact, this is my second run through it. One thing the Kindle does is tempt you into reading books multiple times. I mean, they're all just sitting right there on the list! Flickering Pixels is somewhat of a theory of a book. The basic idea is that, throughout history, the way that we communicate has been changing over and over with the invention of new technology, and as a result, the way that we collect information has changed over and over as well. In the end, one might be trying to communicate a certain message, but it is in fact the way that the message is being communicated that speaks the loudest to the listener. I've noticed this to be true in pretty much every day I've been reading this book. In fact, right now my boys are watching a DVD called 3,2,1 Penguins. It is from the makers of Veggie Tales and it is just as much, if not more annoying that the little vegetables walking around. Their big, fat, probably diabetic grandma brings them a giant piece of cake to eat... in bed... right before bed! Every freaking episode! In the "envy" episode the little girl gets her cake and then starts to say, "Hey, his piece is bigger than..." then she stops herself, remembering the lesson. The problem I have with this show is that the message of the episode is lost right at the end of it when the kids are busy chowing down cake. The pieces of cake are the size of their heads! Obviously, the Veggie Tale people want to shake off the image of healthy eating. The best way to do that is to give your characters giant slabs of cake before bed. Anyways, this is a small but relevant example of the medium (cartoon TV show with characters eating cake) is more powerful than the message (do not envy). The TV itself is a medium that speaks louder than any message communicated from it. The technology involves providing the viewer with what to see and think. It dulls the imagination and, as most people would agree, is very addictive. 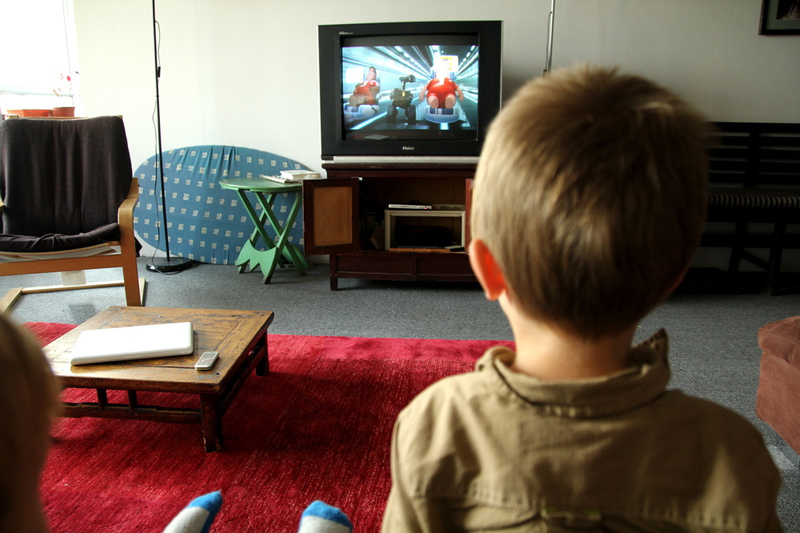 While our kid's minds and creative juices are developing, it is all too easy to just plop them down in front of some crappy show with some sort of 'moral message' to justify it. 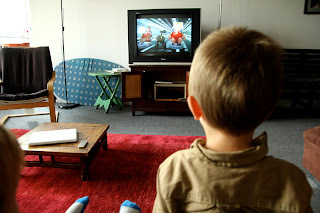 I'm not saying that I will prohibit my kids from watching TV. I think that the main thing is to be aware of the dangers of relying on it, and that the threat of addiction is always there. It will effect you if you're not proactive in finding other ways of nurturing and building up your child's imagination. Hipps talks a lot about how the printing press changed the way we use our brains. With it, people started to use the left side of their brain, the part that likes to organize and make logical sense of things. Then, there was an overuse, and anything that wasn't in print was considered to be not quite right. Then, later on when someone invented the camera, people started to use the right side of their brains. Reading a book is one word at a time, page by page, where as looking at a photo requires taking in all of the information at once. Thus, these two mediums involved using both sides of the brain. People sit in giant office buildings, getting paid thousands of dollars to figure out a way to make you want to buy a vacuum. The world tells us that they have developed way that we can be healthy by working out less. The Tim Horton's radio commercials that I hear while listening to hockey games talk about "eating healthy" by ordering an egg white English muffin. Facebook is a way to have shallow relationships with hundreds of friends. And what about Blogs? Well, I have to agree that blogs are a part of the shallow world of the Internet. As Hipps puts it, "The mind is the flat stone that skips along the surface of an infinite amount of information." I try to write things that would be interesting to people so that more people come and read them. There is nothing wrong with that, it's just that it contributes to all of the other noise of people trying to get your attention. While a book is often times 1000 pages of depth, a blog has a couple hundred words one day that are completely unrelated to the previous entry. I am challenged to give this blog a little bit more of a direction. Eventually, I want it to go somewhere. I would like to look back on it as progression and growth. I want to be able to visually see differences between posts from 2008 and now. That is the goal. In the meantime, I would suggest taking a look at the book. EDIT: The medium for me is a relatively quick read of a blog post. The message is to encourage you to read more books and watch less TV. What one came through for you? I like your medium (something I can completely read while eating lunch) and I think I'm following your message too...love the Kindle! What show are you going to watch? I am glad that you can access my "amazing blog" in Indo!